Why Are Cowboys Trending in Fashion Right Now? The answer depends on your take on the current American political climate. 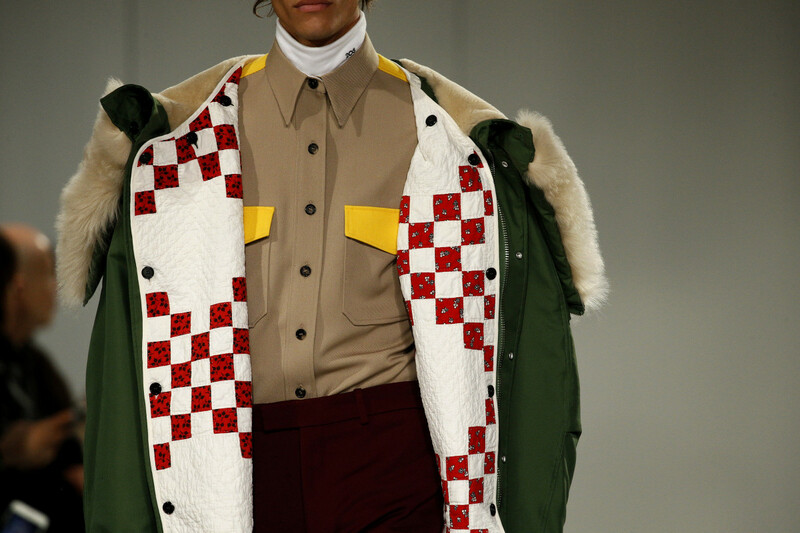 Fashion purveyors have discussed Raf Simons&apos;s reimagining of the American Wild West through Calvin Klein, as seen through its pointed-collar snap-flap breast pocket shirts and steel-toed cowboy boots, ad nauseum. Luckily, a crop of new collections points to a new frontier for cowboy inspiration. 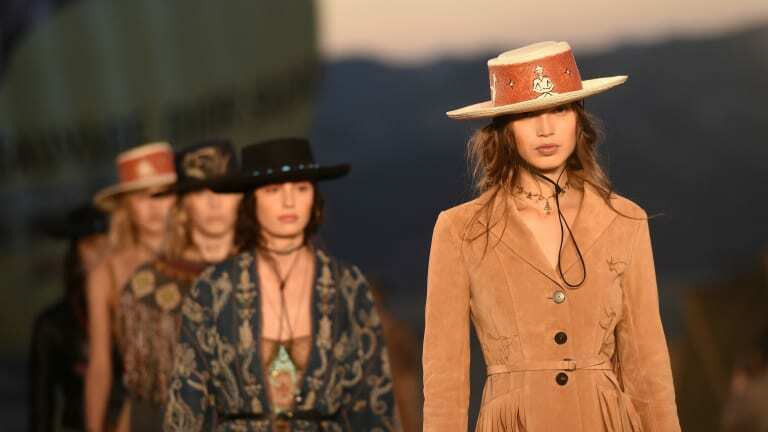 There are the gambler hats, bolo ties, and prairie dresses at Dior&apos;s Cruise 2018 collection, debuting at twilight in Calabasas, Calif.; showing for Fall 2018, Isabel Marant married leather and fringe on top and metal-toed thigh-highs down below; Most recently, Nicolas Ghesquière included cattleman&apos;s crease hats and blouses, knitted to look like woven rugs with Native American motifs, in Louis Vuitton&apos;s Cruise 2019 range. And these are only three runway examples among dozens more, showing both in America and Europe, according to WGSN Catwalks Director Lizzy Bowring. "This trend is not just sitting with American designers," Bowring tells Fashionista in an email. "Last season, Fall 2018, saw such European designers as Natacha Ramsay-Levi at Chloé, Max Mara, Ports 1961 and Versace all taking in some reference from Western ideas and infusing them into their collections. There were oversized blankets, pony-skin tops, fringed skirts — the iconic Western shirt detailed with piping or fringing or piecing and patching of garments to provide the consumer with individuality." Jaylin Ramer, owner of the Space Cowboy shop in New York City&apos;s Soho neighborhood (which sells all that you might expect with such a name, and counts actress-turned-gubernatorial candidate Cynthia Nixon as a previous customer), notes that stylists are coming into the store more frequently asking for unique pieces inspired by Western themes. "Stylists come to the store all the time asking if we have interesting things like bolo ties, cowboy hats, ostrich belts, stingray belts and crocodile belts," says Ramer. "I think they see it as different. But they&apos;re all coming in and people are like, &apos;Oh, I get it now!&apos;"
If thinking about cowboy boots makes you queasy with memories of unsightly, rhinestone cowboy cambions of the early aughts, the latest iteration of American Western iconography is perhaps less Paris Hilton-and-Nicole Richie-venture-off-to-be-ranch-hands and instead a more globalized take on the American classic. "As consumers move into the future with an eye on modern aesthetics, they also bring an air of nostalgia, where a collision of cultures and bygone eras inform the present," says Bowring. "The desire to escape prompts the experiential, combining heritage, history and folklore. This idea of blending cultural references sits alongside the rise of an irreverent, yet casual youthfulness of globalized street culture." Speaking of street culture, Ramer notes that the pivot towards the cowboy boot might have something to do with an air of ennui directed at the sneaker craze that has overtaken luxury and accessible brands alike. "People are traveling more than ever, and they want a uniform look," says Ramer. "You can wear a cowboy boot to dinner, dressed up, to a concert, to go on a hike or to walk a city. A sneaker is practical and comfortable, but so is the cowboy boot." So, why now? The answer depends on your take on the current American political climate. "The times we tend to see cowboy dress appearing in fashion are times when America is either ultra-patriotic or under stress," says Dr. Laurel Wilson, professor of textiles and apparel at the University of Missouri. Just before World War II, wealthy Americans were no longer comfortable traveling to Europe and instead opted for Dude Ranches, and so with their travels came a West-to-East sartorial exchange. From there, Western themes re-appeared in American fashion through the 1950s, 1970s and even into the early 1990s. The cowboy isn&apos;t so heroic these days, though. Outside of fashion, one thinks of the HBO series "Westworld," in which a fictional escape replete with the excitement and rugged adventurism of the Wild West becomes a man-made hell on Earth. Is &apos;Made in America&apos; Fashion Inherently More Ethical? As for the political, when Isabel Marant showed Fall 2018 in Paris, Vogue&apos;s Chioma Nnadi noted that the French designer&apos;s collection was surprising, specifically noting that "the style myth of Americana continues to thrive given the epically low international approval ratings of the States right now." For what it&apos;s worth, Wilson says that European — particularly German — and Japanese tastemakers have always been fascinated by cowboy culture. When the Las Vegas massacre happened in October 2017 during a country music festival, killing 59 people and injuring hundreds more, an image of a pair of starred and striped cowboy boots circulated widely. The boots laid abandoned after the shooting, encompassing the day&apos;s darkness and the great American gun debate at once. Could the American cowboy, once a symbol of true grit and prosperity, be so dirtied by political muck? Perhaps. Our American heroes are so often unduly romanticized, after all. The solitude, serenity and sprawling landscapes of places like New Mexico, Utah and Nevada are calling models, designers, photographers and influencers in droves. 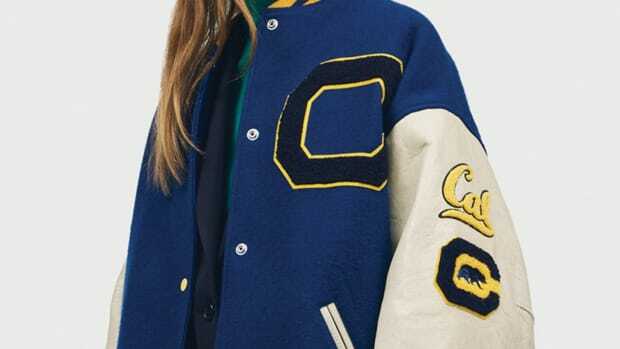 College-licensed apparel has found its way onto runways and into tastemakers' closets, just in time for back-to-school season. 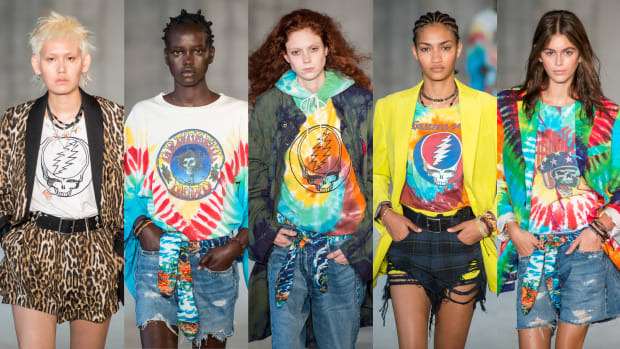 Why, in 2018, Is High Fashion Fixated on the Grateful Dead Aesthetic? From tie-dye to lightning skulls, the iconic imagery represents a collective sense of nostalgia, as well as the yearning for a more carefree and optimistic time.